Jason and I met at UCLA in the fall of 1994. 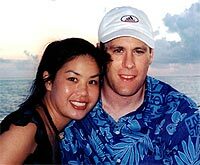 We had our first date on January 20, 1995, and got married on February 16, 2002. (For more wedding details, go to our wedding website). We live in California with our beautiful daughter Delilah, and Arby, our Bernese Mountain Dog. Our adorable bunny, Little Gooshie Bun-Bun, passed away in December 2004. I'm a stay-at-home mom and Jason works in software. We're living in California and are lucky to be surrounded by loving family and friends.